Dixie Supply Co. Inc. was founded as Virginia Wrecking & Salvage Co. in 1922. The principals were M. Louis Shaffer and Isadore D. Sharove. Hill's Petersburg City Directory listed them as proprietors from 1922 through 1927. There was a sales office at 44 Bollingbrook St. and a warehouse and lumber yard at 435 Grove Ave.
By 1927 the name had changed to Dixie Supply Company, and there was an additional location (318 N. 2nd St.). By 1929 Shaffer seems to have left, and Isadore Sharove was joined by Samuel H. Sharove. M. Louis Shaffer was Milton Louis Shaffer (1894-1961). He was born in Allentown, Pennsylvania, 29 June 1894 and died in Richmond, Va., 24 December 1961, where he followed the trade of scrap metal dealer. His wife was Mattie Sharove, a sister of his partner, Isadore D. Sharove (1899-1945). According to the ship's manifest of the SS Duchess of Atholl sailing from New York 27 July 1932 and arriving New York 5 August 1932, the "D" in Isadore Sharove's name stood for Dixie, hence the name Dixie Supply! "Sharove, Samuel H,. enlisted in Ordnance Corps, Fort Myer, Va., December 15, 1917, and assigned to Supply Division, Washington, D. C. ; transferred to Ordnance Training Company, University of Pittsburgh; to Ordnance Training Camp, Camp Hancock, Ga. ; returned to Washington ; here, while standing physical examination for commission, it developed he had, in his eagerness to enter the service, 'defrauded' the Government upon original enlistment by memorizing the eye-chart, his sight being bad; for this he was court-martialed and reduced to firstclass private, and placed in Class C, Limited Service, and assigned to duty at Springfield, Mass., Armory; discharged February 21, 1919; nearest of kin, David Sharove, father." and: "Sharove, Isadore, Acting Supply Sergeant, S. A. T. C, Carnegie Institute of Techonology [sic], Pittsburgh, Pa.; nearest of kin, David Sharove, father." In 1930 both Isadore and Samuel Sharove lived at the Hotel Savoy, 308 2nd St., Petersburg. Isadore Sharove was also proprietor of the Hopewell Supply Co. in nearby Hopewell, Va. The pater familias of the Sharoves was David Solomon Sharove (1868-1921), an immigrant from Russia, who was a grocer in Richmond, Va. David S. Sharove is buried in Sir Moses Montefiore Cemetery in Richmond, as are M. Louis Shaffer, Mattie Sharove Shaffer, Samuel H. Sharove, and Isadore D. Sharove. In 1948 and 1950 Isadore Sharove's widow, Sarah G. Sharove (née Green) was listed as proprietor of Dixie Supply Co. Among others, she was followed by Robert L. Green (her brother) and Morton L. Wallerstein. Robert Lee Green (1910-1966) was born in Columbia, South Carolina. He appears in the 1910 U. S. Census as the infant son of B. Green, an immigrant, working as a cutter in clothing manufacture. In 1940, age 30, he was an assistant buyer, retail department store, living in Richmond, Va.
Morton Ludwig Wallerstein (1890-1980) was born 7 December 1890 in Richmond, Va., and was a partner in the law firm of Wallerstein, Goode & Dobbins in that city. Liquor Laws of Virginia, 1915, annotated by Morton L. Wallerstein can be read online at babel.hathitrust.org/. Dixie Supply dealt in building materials, plumbing and electrical supplies, lumber, paints, oils and glass. It was not until the mid-1940s that Dixie Supply moved to the building above at 15 West Old Street. This ad from 1948 shows the new address. 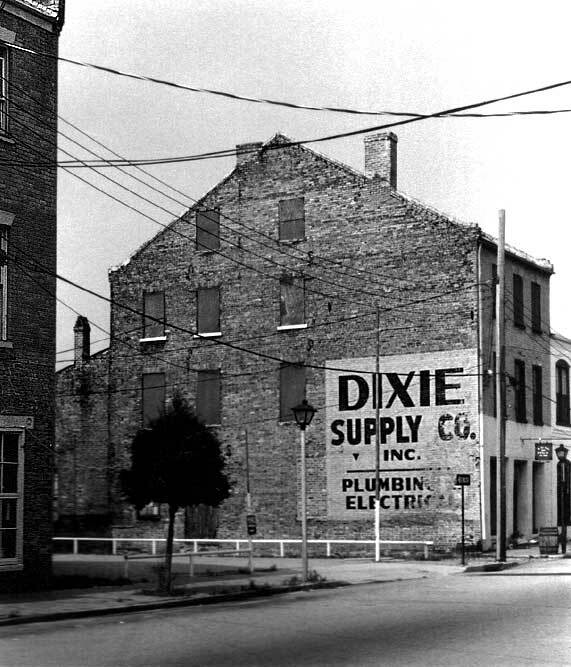 The last listing for Dixie Supply in the Petersburg city directory was 1958. As of Feb. 2007 this sign was still extant but now obstructed by a fence directly across the alley which the sign faces.